This entry was posted in Uncategorized on August 30, 2014 by Gary. This entry was posted in Uncategorized on August 28, 2014 by Gary. This entry was posted in Uncategorized on August 27, 2014 by Gary. If one looks at a longer term chart of the last two years it’s very clear that gold is being capped at certain levels, and those levels are slowly forcing gold lower and lower. Each one of these manipulation zones are being defended successfully and that has some serious connotations going forward. This all started right after the announcement of QE3. 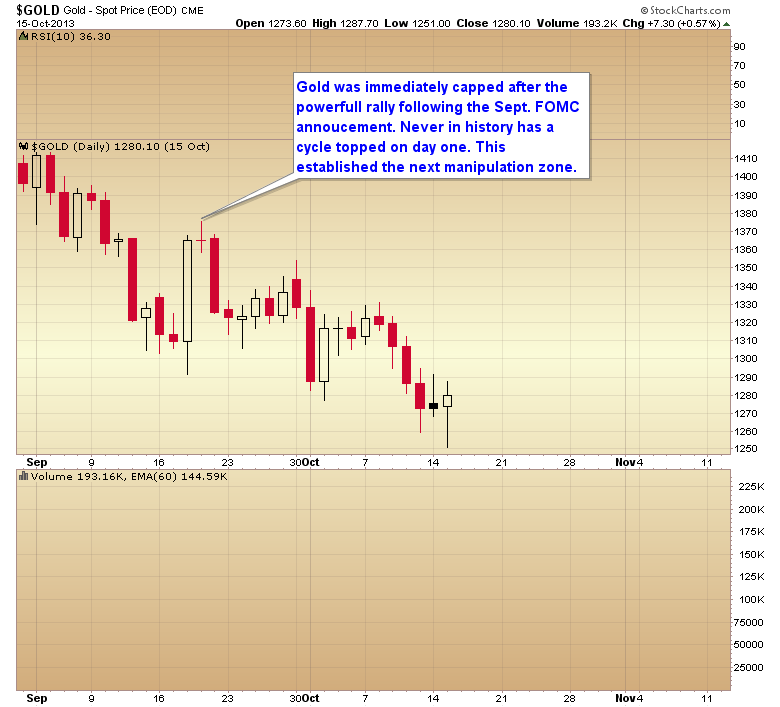 Gold was driven below $1700 and held below that level for 2 months. 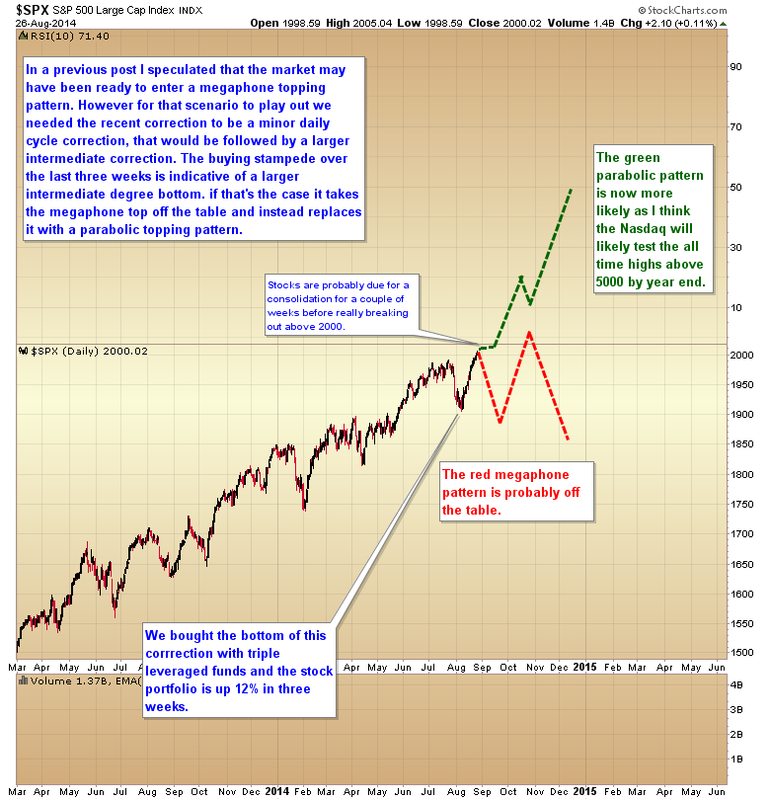 This got the ball rolling so to speak, it broke an intermediate cycle and started the bear market. Of course we all remember the call by GS to sell gold short followed by the premarket attack on April 12 that took out the stops below $1520 leading to a waterfall decline. 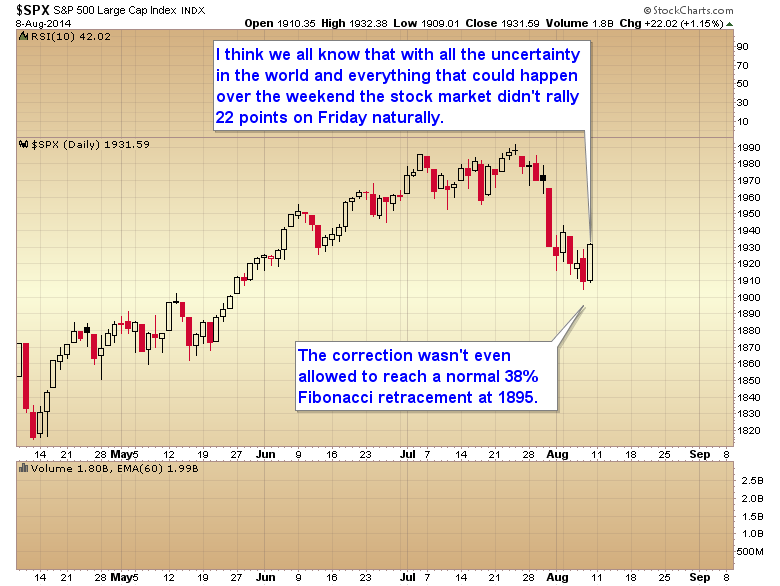 That had to be one of the most blatant cases of manipulation in market history. Without a doubt gold completed a final ICL on Apr. 16. The May retest was the beginning of what should have been a recovery from the manipulation and a resumption of the secular trend. But then something happened. As gold tried to rise above $1400 we saw repeated attacks to keep gold below that level eventually leading to another waterfall decline in June down to $1179. 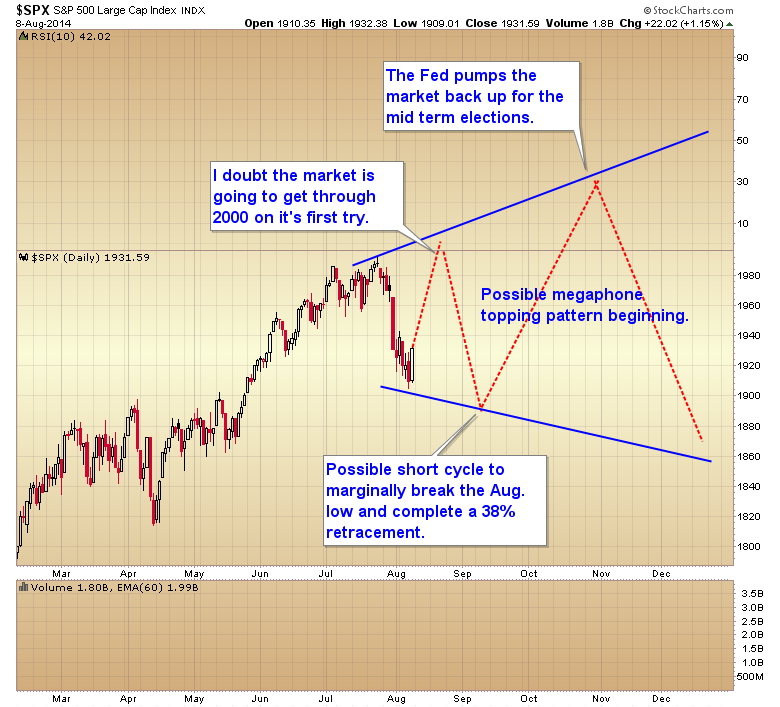 In the process this created a 33 week intermediate cycle. A full 10 weeks longer than normal. The natural ICL occurred on week 23 at the April bottom. 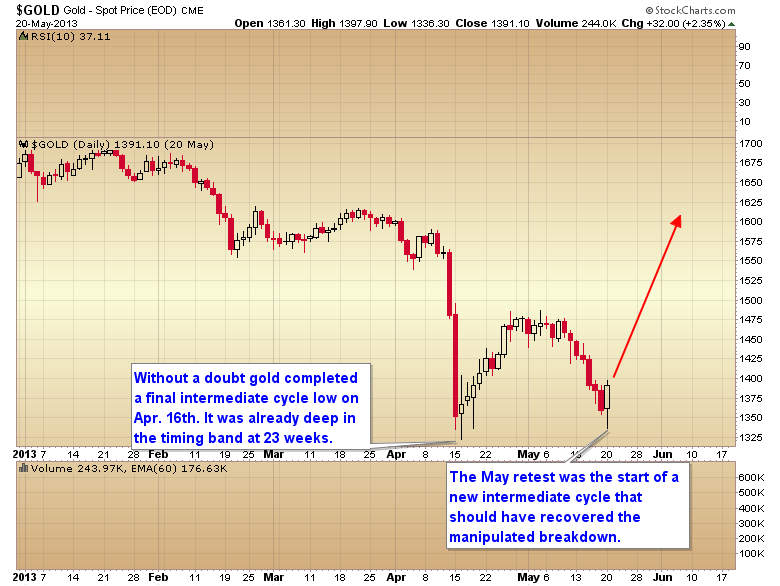 The manipulation to prevent a new intermediate rally above $1400 added a full 10 weeks to the cycle. And let me say that having observed these cycles for over 10 years I can say without a doubt that a failed intermediate cycle in decline never stretches an extra 10 weeks. 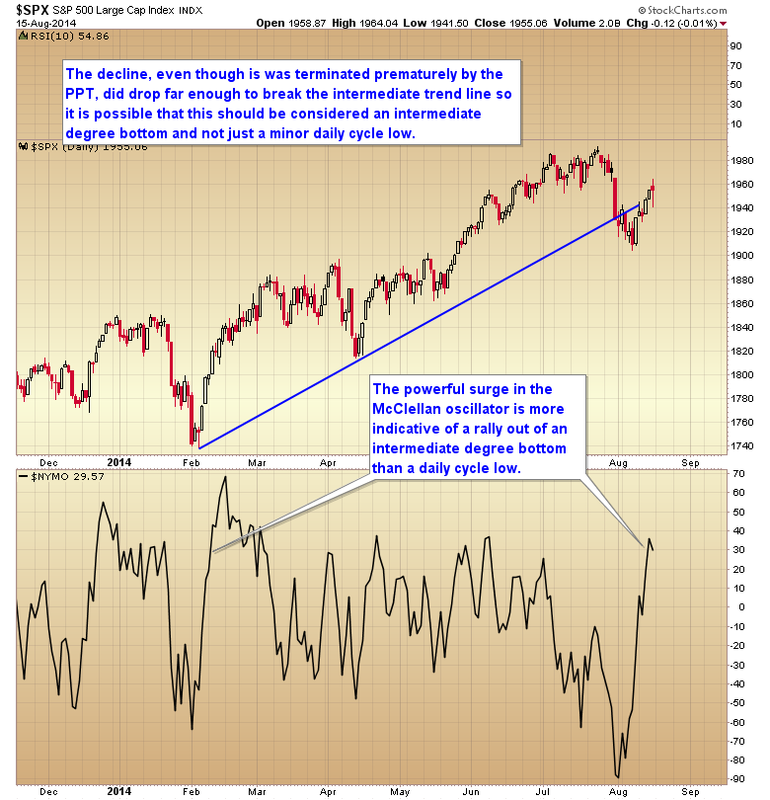 Most of the time they bottom a bit prematurely as the selling pressure tends to exhaust itself quickly. So a manipulation zone had been established between $1400-$1430. 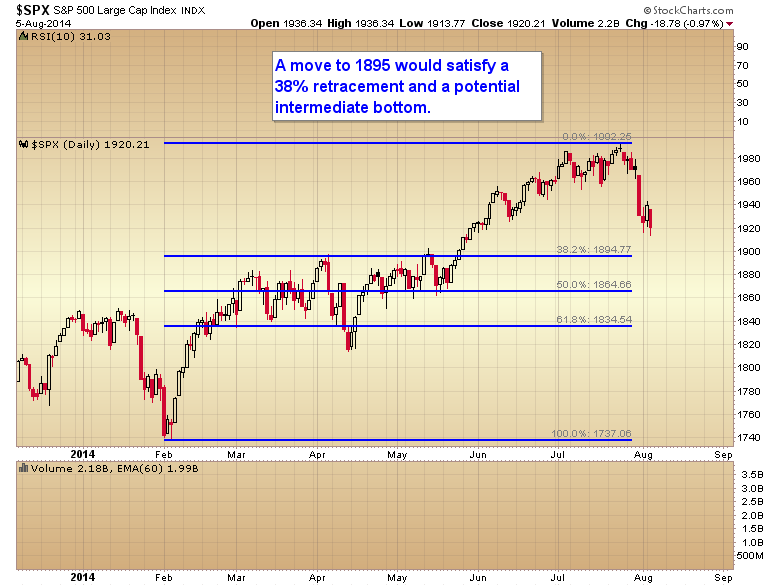 The next intermediate rally out of the June bottom was capped right at that $1430 level. The zone had been successfully defended. 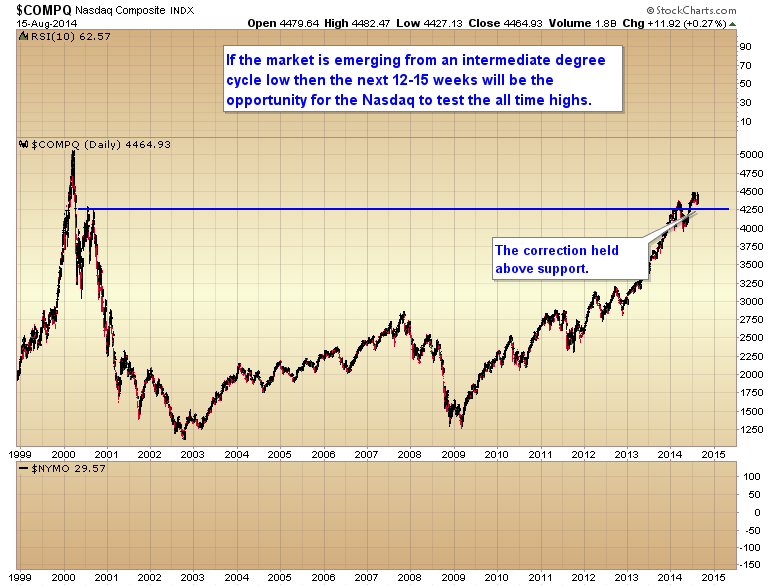 This then led to another stretched intermediate cycle. Again having watched these cycles for years I can say without a doubt that two stretched and declining cycles in a row isn’t a naturally occurring event. The powers that had created this bear market were trying to run the stops below $1179 and in the process they stretched a second intermediate cycle. 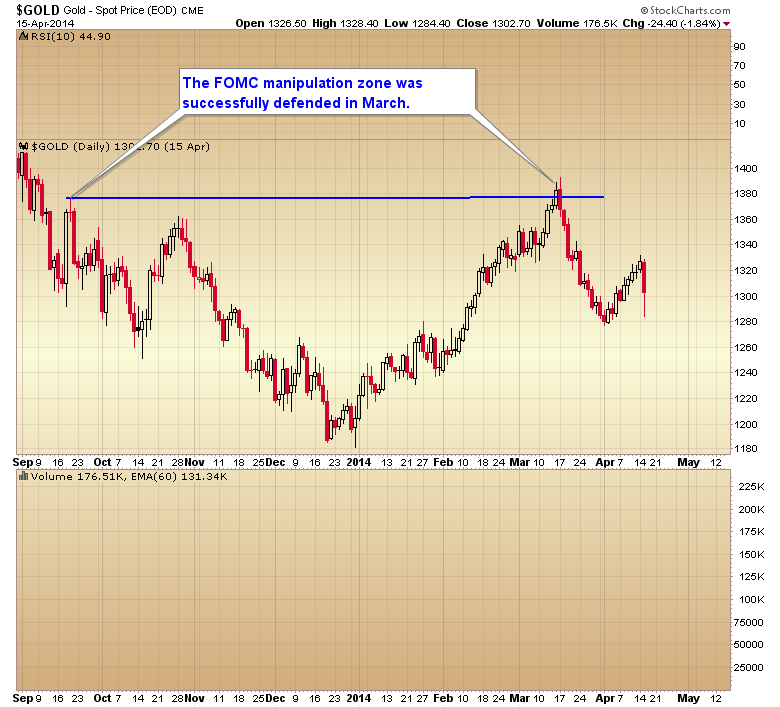 The next blatant manipulation of the gold market occurred right after the Sept. FOMC meeting. 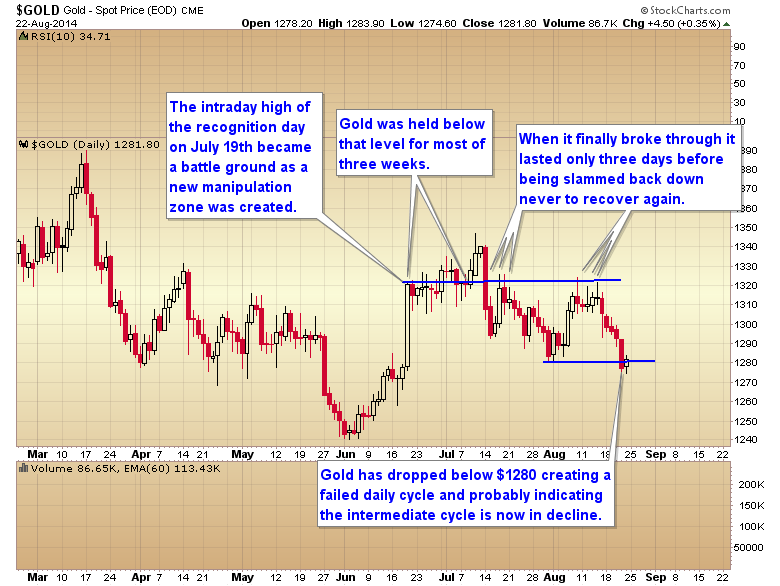 Gold was immediately taken down the very next day creating a daily cycle that topped on day 1. Never in history has a daily cycled topped on day 1. This established another manipulation zone at $1375. 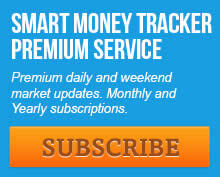 The intermediate rally out of the Dec. 31 bottom poked above that $1375 level for 1 day before it was turned back down. Another manipulation level was being successfully defended. We now we have another manipulation zone that has formed at the top of the recognition day on Juun 19 at $1320. 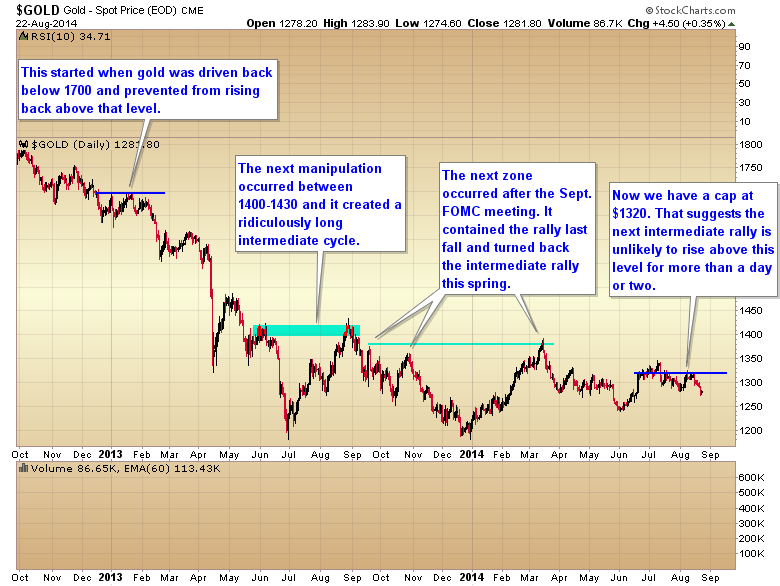 Other than just a few days above that level the zone has been defended and it has now broken the intermediate cycle. What is concerning is that every one of these manipulation zones are being successfully defended when challenged. That would suggest that the next intermediate rally is unlikely to get above $1320 for more than a day or two before it too is turned back. At this point it has become painfully obvious that once a manipulation zone is established the powers in the paper market can defended them, and each one of these zones are occurring at lower and lower levels. I think traders need to recognize this fact and adjust their trading accordingly. One can only go long the sector at an intermediate cycle bottom, and once that rally approaches a manipulation zone get out and stay out until the next intermediate bottom. 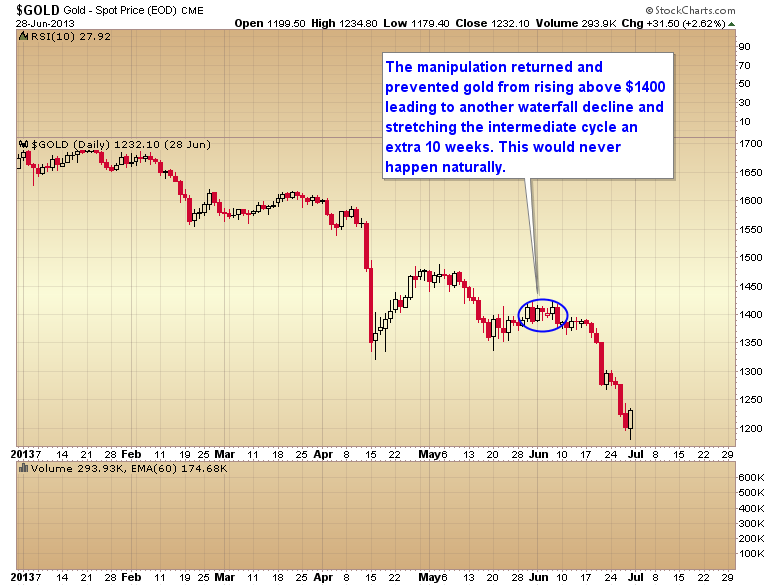 As this pertains to the gold market right now it would suggest that we aren’t likely to see $1320 recovered quickly. I honestly don’t know what it’s going to take to break this pattern in the gold market. If two ongoing wars isn’t enough to drive gold through the $1320 suppression zone who knows what kind of black swan event will have to occur to trigger a resumption of the secular trend. 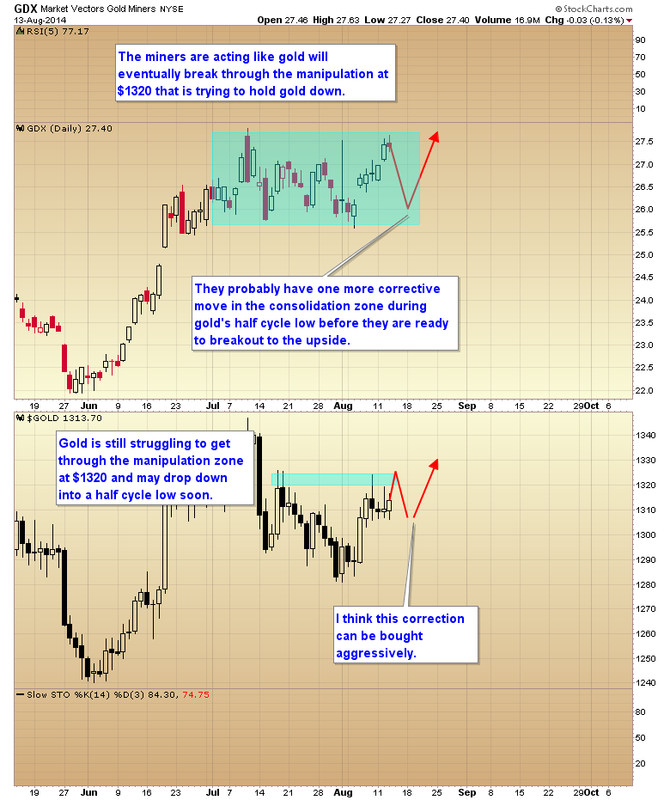 For now I have locked up our gains in the metals and I’m going to continue to sit on the sidelines until gold gets into the timing band for the next intermediate bottom, and that isn’t due for another 7-12 weeks. 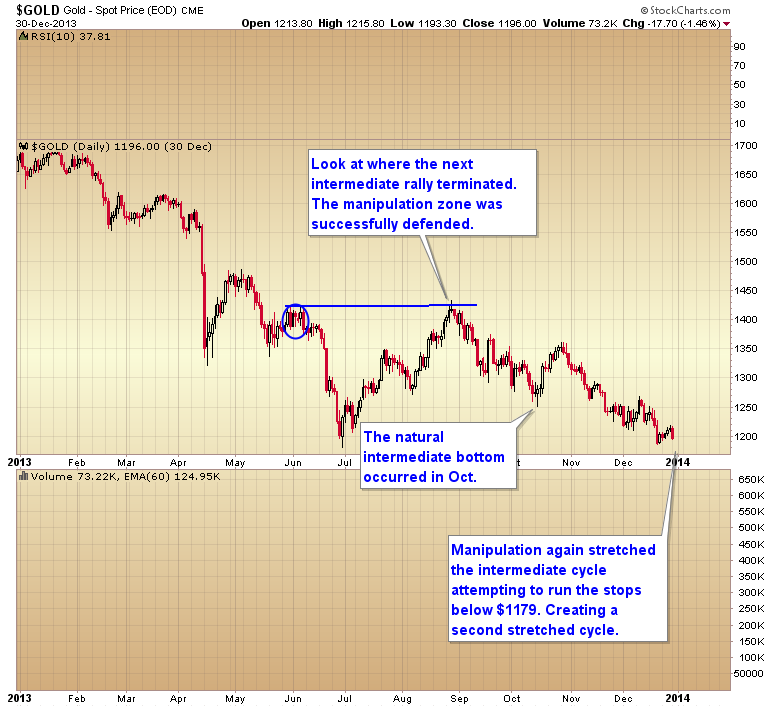 If we see a manipulation zone challenged and broken, that will be our clue that gold is ready to trade freely again. As of right now that would mean a sustained move above $1320. If that were to occur that would get me off the couch and back into the market. If not, then I will wait patiently for the next buying opportunity in 2-3 months. 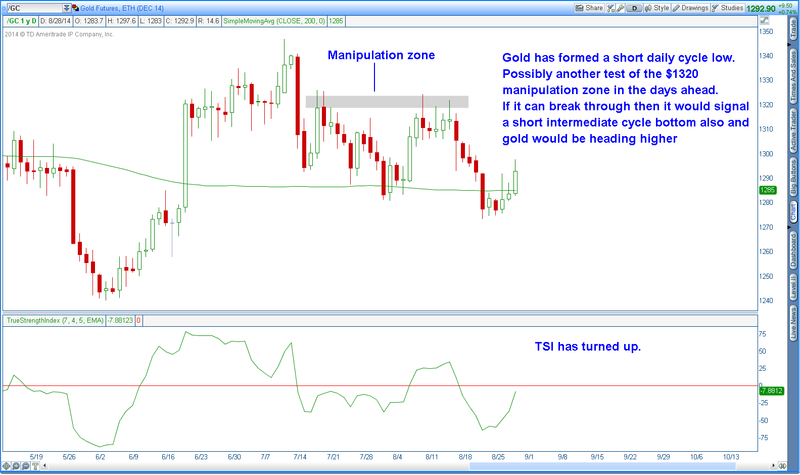 So far the SMT has made good money buying these intermediate bottoms and exiting when gold pushes into a manipulation zone. But until the manipulation has been broken, a buy and hold strategy is no longer an option as each one of these zones is occurring at lower and lower levels as the powers in the paper market try to keep the bear market alive. This entry was posted in Uncategorized on August 24, 2014 by Gary. This entry was posted in Uncategorized on August 19, 2014 by Gary. This entry was posted in Uncategorized on August 17, 2014 by Gary. This entry was posted in Uncategorized on August 14, 2014 by Gary. 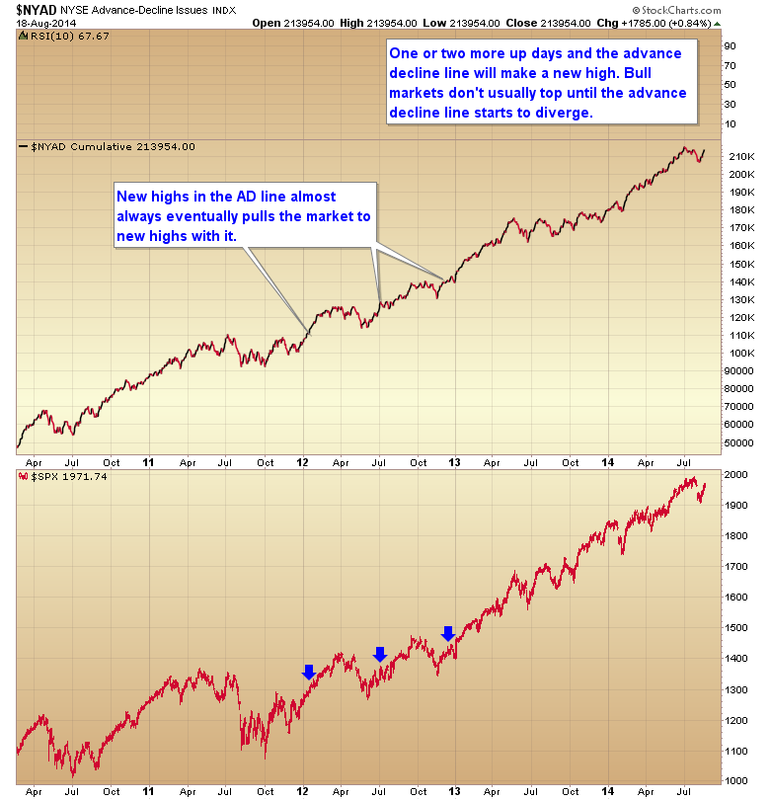 ARE STOCKS FINALLY STARTING THE TOPPING PROCESS? With all the uncertainty in the world, and everything that could happen over the weekend, I think it’s safe to say that the market didn’t rally 22 points naturally to complete a swing low as we go into the weekend. When I saw the index futures turn from deeply oversold to positive as if by magic in the pre-market Friday morning I had a pretty good idea that the Fed was ready to put an end to this correction. By the end of the day it looks like they probably succeeded (at least for now). Now the question becomes, since the Fed didn’t allow even a 38% retracement is this just a daily cycle low, or was that all we are going to get for an intermediate degree correction? 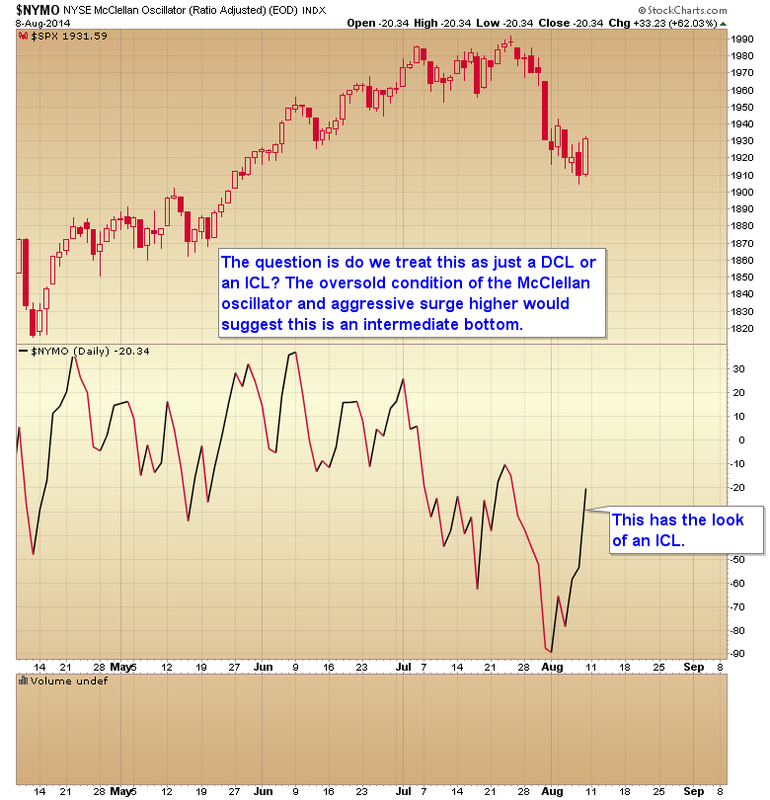 Looking at the McClellan oscillator this kind of powerful surge is usually indicative of an intermediate degree bottom. However, I’m not sure that’s going to be the case here. If we consider that this correction was terminated prematurely then I suspect we are going to have to retest these lows in the coming weeks so what I think is likely to play out is a move back up to and maybe marginally above 2000, followed by another move down that at least retraces 38% of this intermediate rally. 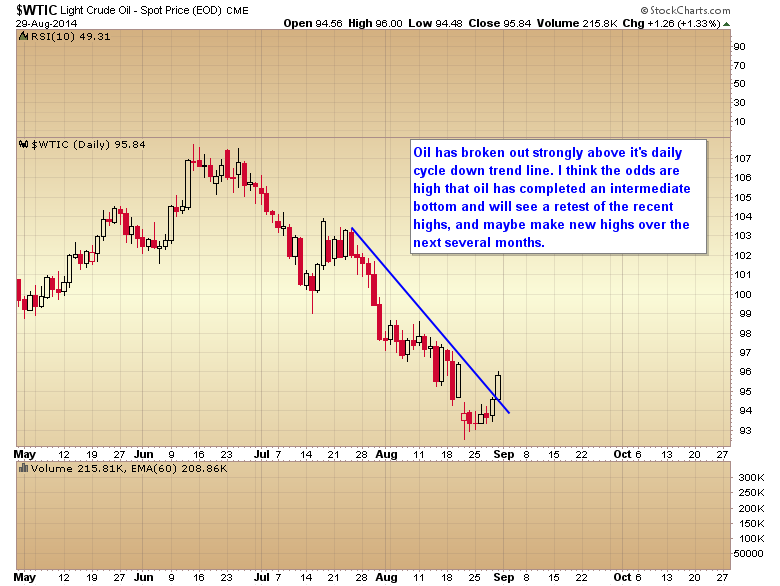 In other words I’m looking for a short daily cycle that makes a slightly higher high and then a marginally lower low. That should set the market up for the Fed to ram it back up ahead of the September FOMC meeting and probably through most of October ahead of the midterm elections. 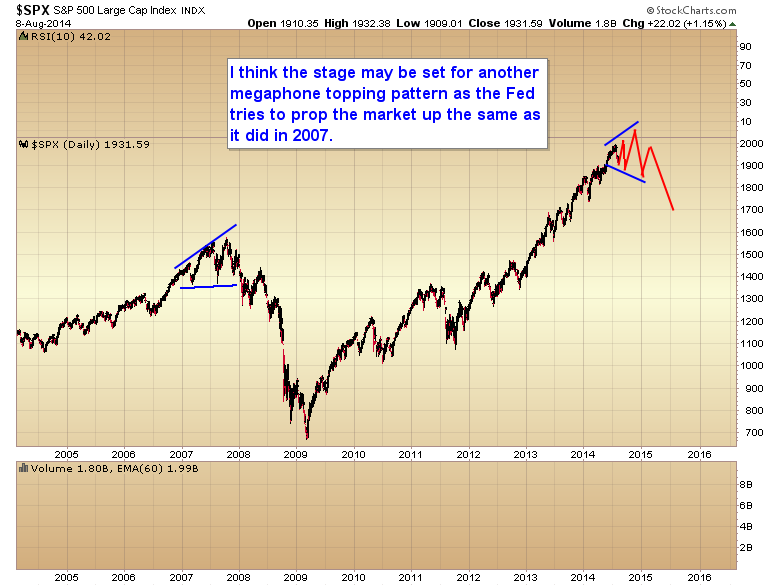 As a matter of fact we may be looking at a potential megaphone topping pattern in the months ahead. This was how the last bull market topped also, as the Fed tried to artificially prop the market up with zero interest rates and trashing the dollar. Unless we get a miraculous reversal on Monday that does test that 38% retracement, I suspect the stock market has a date with the 2000 level pretty quickly. I don’t think the S&P is likely to get through that level though, at least not on it’s first try. 2000 is too big of a psychological level to be easily overcome. This entry was posted in Uncategorized on August 10, 2014 by Gary. 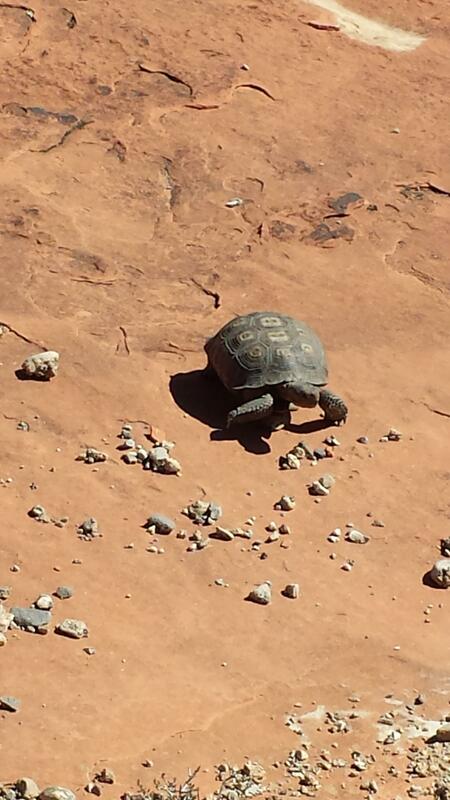 In the 20 years that I have been in Las Vegas this is only the third time I have ever seen a rare desert tortoise. He was walking across the trail in front of us as we headed to a rock climbing area this morning. Calvin and Chanel didn’t know what to make of him. These guys can live to be 100 years old. Pretty impressive considering the harsh climate in the Mojave desert. This entry was posted in Uncategorized on August 8, 2014 by Gary. This entry was posted in Uncategorized on August 5, 2014 by Gary.